Available exclusively at Sephora, IT Cosmetics Bye Bye Exclusives is a Color Infused Skincare Collection designed to help you say bye bye to everything from dark circles and pores to stubborn makeup and fine lines. Bye Bye Under Eye Illumination Full Coverage Anti-Aging Waterproof Concealer ($24). Infused with anti-aging hydrolyzed collagen, peptides, vitamins, hyaluronic acid, antioxidants and a Drops of Light Technology, this concealer promises to minimize the appearance of fine lines and wrinkles while adding natural-looking radiance for more youthful-looking skin. There are 4 shades available and Medium is perfect for my NC20 skintone. Despite its super thick formula, the concealer felt really creamy and the tiniest dot blended seamlessly into my skin, erasing signs of circles and fatique. My undereye area looked instantly brighter and more even, but not cakey nor dry. Bye Bye Makeup 3-in-1 Makeup Melting Cleansing Balm ($38). Containing deep-cleansing extracts, botanicals, anti-aging collagen, hyaluronic acid, shea butter and a Skin-Softening Serum Concentrate, this dissolves makeup while hydrating and providing a soft barrier of moisture to help ward off free-radicals and pollutants for healthier, younger-looking skin. A nickel-sized amount managed to effectively remove the waterproof mascara, Bye Bye Under Eye Illumination Full Coverage Anti-Aging Waterproof Concealer and Anti-Aging Armour Super Smart Skin-Perfecting Beauty Fluid SPF 50+ I was wearing. My face was left feeling super soft, smooth and nicely hydrated. Bye Bye Under Eye Eye Cream Smooths, Brightens, Depuffs ($48). This is formulated with collagen, essential oils, caffeine, vitamin C, copper, blue algae, peptides, hyaluronic acid and cucumber extract to hydrate, firm and restore radiance. 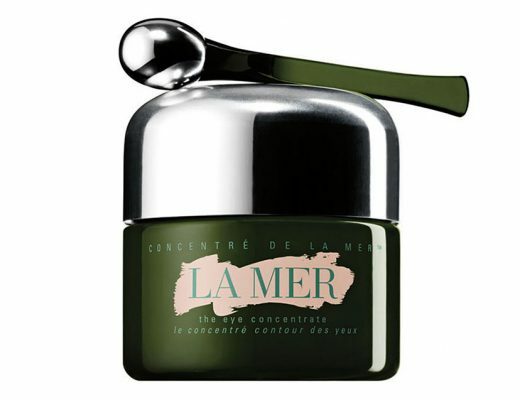 Its gel-cream texture sank in within seconds and left my undereye area moisturized, toned, refreshed and makeup-ready. The cream also has a slightly blue tint that claims to brighten undereye circles, though I did not notice a huge difference in mine. Heavenly Skin CC+ Skin-Perfecting Brush #702 ($48). Featuring patent-pending Heavenly Skin hair infused with anti-aging collagen, silk, peptides, niacin and antioxidants, this comes with a custom-cut brush head to optically blurring away the appearance of lines, pores and imperfections for an airbrushed, flawless finish. The bristles felt dense yet SOOOOO soft and blended skincare and makeup products beautifully without looking streaky. Je Ne Sais Quoi Hydrating Color Awakening Lip Treatment ($24). Developed with plastic surgeons, the peptide-infused formula is packed with essential butters and oils, hyaluronic filling spheres and antioxidants to smooth the look of lip lines, treat and condition and lock in moisture for supple, pillowy-soft lips. It kept my dry lips moisturized for hours without feeling slick. Thanks to its Vitality Lip Flush Technology which contains special pigments that react with the warmth of your lips, it also added a pretty light pink hue to my pout. Bye Bye Pores Primer Oil-Free Poreless Skin-Perfecting Serum Primer ($38). With powerful skin-loving ingredients (Moroccan lava clay, colloidal clay, purifying charcoal, papaya fruit extract, hydrolyzed collagen, hyaluronic acid, peptides and niacin) to hydrate and treat skin, this utilizes an exclusive Bye Bye Pores Optical Blurring Technology to blur the look of pores, fine lines, wrinkles and uneven texture. On my dehydrated combination skin, the white cream left behind a lightweight, velvety finish that helped makeup glide on more easily, while making the pores around my nose and cheeks less noticeable. Anti-Aging Armour Super Smart Skin-Perfecting Beauty Fluid SPF 50+ ($38). Infused with peptides, niacin, hydrolyzed collagen, hyaluronic acid and antioxidants to hydrate, brighten and repair, this physical sunscreen comes tinted with a Skin-Perfecting Technology to optically blur away discolorations and imperfections. Although the color looked darker than my NC20 skin tone, it blended in perfectly without making me look orange or dirty. Right away, my skin looked more even with a soft, satin finish that is great for everyday. Bye Bye Lines Serum Advanced Anti-Aging Wrinkle-Smoothing Miracle Concentrate ($58). Suitable for all skin types, this is formulated with anti-aging peptides, caviar extract, sea water, hydrolyzed collagen, algae, hyaluronic acid, argan oil, babassu oil, along with Vitamins A, C, E, B1, B2, B3, B5, B7, B9, CoQ10 and licorice root to hydrate, firm and brighten skin. Its weightless texture left my skin velvety smooth and the tiny sparkles added a nice glow as well. 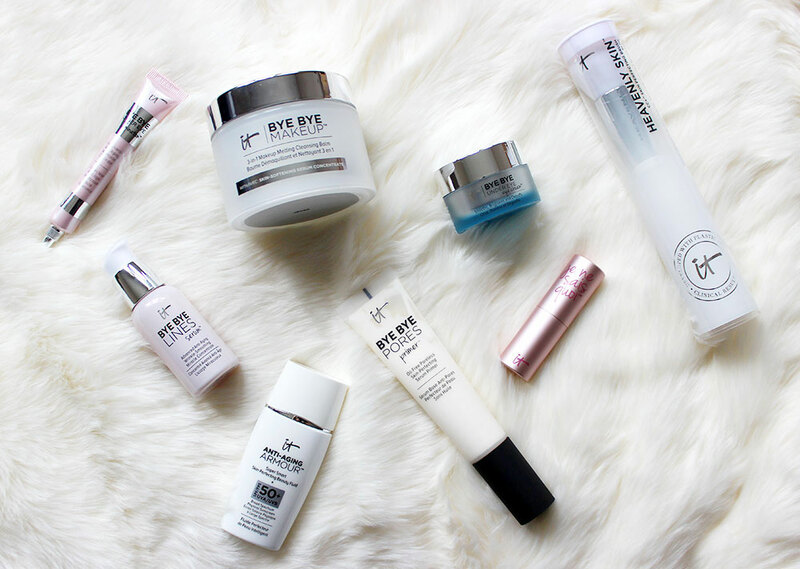 Overall, I am loving the IT Cosmetics Bye Bye Exclusives Color Infused Skincare Collection! The products worked very well with each other and my skin has never been happier. IT Cosmetics Bye Bye Exclusives Color Infused Skincare Collection is available at Sephora.com. Prices range from $24 to $58.